Whether you’re living in L.A. or New York, money is always tight for many beginner filmmakers. We have to take odd jobs as PAs. We have to film corporate videos to make a living. But at the end of the day, we all want to be the next Christopher Nolan or another visionary like Kurosawa. Budding artists, producers, directors, musicians, choreographers and others need some space where they would be in a position to unlock their potential to the best of their abilities. However, it’s expensive to rent out studio space until you have a production company with a good pipeline of commercial projects. If you have a YouTube channel with a good following, one way to get cheap (i.e. FREE) studio space is to apply for the YouTube space in NYC. Check out the link to see if you qualify and details on how to use this incredible resource. This studio created by Youtube provides production resources which are modern and state-of-the-art. This will most certainly be helpful for the new entrants to create their next videos, which could take them to the next higher level. The facilities for making such videos are available to the budding artists free of cost and this certainly is a big deal to say the least. The first section deals with online training and this covers the various policies, rules and regulations, booking procedures, a clear idea and overview of the resources and how to use them. Further the new entrants are also taught quite a few things about copyright training. The entire online training is quite useful and interesting and should take around an hour to complete. Once the online training has been completed successfully, the successful applicants will be given an agreement form which needs to be signed. It is referred to as the Master Use Agreement and is abbreviated as MUA. This basically is a formal agreement which new creators and budding talents have to make with Google. Only when this agreement is made will Google permit them to use YouTube space. You can use the YouTube Space resources as a new entrant subject you having met some basic qualification criteria. You must have a YouTube channel, and it must have at least 10,000 subscribers out of which 1,000 subscribers must have been registered for non profits. Further they should not have any negative marks. In other words the qualifying channels must not have any Terms Of Service infringement. This will not allow you to unlock the facilities and complete the other orientation processes. The applicants and aspirants must be at least of 18 years age. If you are below the age of eighteen you can still be a part but you should be there with a legal guardian or parent. Further it is imperative that you must not be running a channel which propagates any consumer brand or product. Once the above conditions are met you should be in a position to get going with your training program and you will be able to make use of the resources quite freely. The answer is no. The channels which are participating in YouTube Space for filmmakers continue to retain complete ownership of monetization, content and the creative control of their content. However, we need to bear in mind that the community guidelines are taken seriously by YouTube. Each and every video that is made using the resources must clear the legal hurdle and must be reviewed and certified before being published. Only those videos and projects which are totally free from copyright claims would be able to pass the Community Guidelines. Unless you are sure about passing the Community Guidelines, you should not apply for the space. It’s hard writing the next Oscar winning script in your 400 square foot apartment. You just need a little space and perhaps a space that can fuel the creative juices. At the end of the day, the local Dunkin Donuts will only get you fat with all those late night lattes and blueberry doughnuts. We need a little more pizzazz in our working environment. AWS Pop-up Loft, is a great working space in New York. Professionals can just visit these spaces and do their work in a very relaxed environment. One needs to take an appointment before they visit this working space. People can work and meet up in the AWS premises and working on their filmmaking assignments. It is an ideal place for start-ups and other business professionals who need a office space to work. Another place that is an ideal work space for fimmakers and writers is the Lincoln Center Public space. Where people can work on the co-sharing system, services are available on the first come first serve basis. Working professionals who don’t have a office can simply work here and just work in the relaxed and pleasing environment. There would be charges if the person working there wants to have a cup of coffee or wants a particular supply for their work. Ace hotel is also an ideal place for shared working, professionals can simply just relax in this space. This working space is open for all and anyone who wishes to work in a peaceful environment can drop by the place day or night and just work on their laptops, without having to worry about anything. This working space is very exclusive and one can find different types of books, cocktails, chairs that are way too comfortable. This gives the working professional a very soothing and relaxing experience in this particular working space. This place is very quiet and a person working here can be very focused and won’t have any distractions. The NoMad hotel isn’t like a café where you would find people always talking and people coming in and out, it’s a very quite and peaceful work space. The Wix Lounge is another great example of shared working spaces for the filmmakers and writers, as well as for small teams and start-ups and individuals. They officer space for them to work and focus on their work. 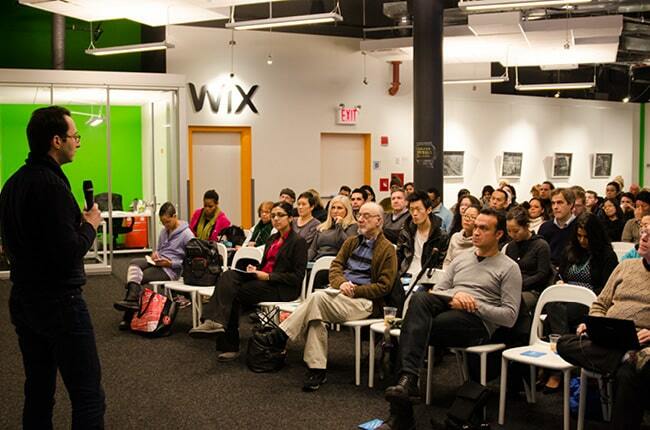 The Wix lounge also has a conference room for the people to hold meetings and conferences in them. Wix also offers coffee, and ample of desk space for the people to keep their laptops and work. One can drop by anytime and start with their work. What is better than getting free food NYC? What will happen when you will have your best food with no money? It sounds strange especially in NYC where food is very expensive and you will have to think twice when you are left with no or little money. However, you can get free food by downloading some free apps. The coupons can enable you to have free food in your favorite location. Not having to pay for your food and drink makes your evening and nights more fun and full of joy. Your food tastes wonderful when it is obligation-free. Now you are looking for free food in NYC. You want to know about the time, location, and name of restaurants. We understand your worry. We will provide all the details in the followings. Next time, whenever you have no money for your food and drink in NYC, you can visit any of them. Let’s look what is free coming up. Foursquare app helps the users to get the best places to sleep, dine, visit, and eat regardless of location across the globe. This app is compatible with Android and iPhone devices. It will enable you to know what is happening around you in the food world. You can get special coupons and promos to get free food. If you are looking for free food, these are the best places to pay a visit. These stores toss their day with two food packing. These items are sealed in plastic wraps and containers. You can collect them on the street. You can have the best food with zero budget. Every day, you can have your free food. You can live on this food for a couple of months for sure. You just need to collect the food from the streets. Do you want a free burger with a draft beer or top shelf liquor? In NYC, you will find many restaurants to enjoy your beer or burger. But when your budget allows you to choose one of them, you will be disheartened. If yes, then visit Merrion square pub. You will get your favorite burger free with a cool beverage. For a free burger, you can visit any time between 12 to 5 pm every day. Crocodile Lounge is popular for free food. 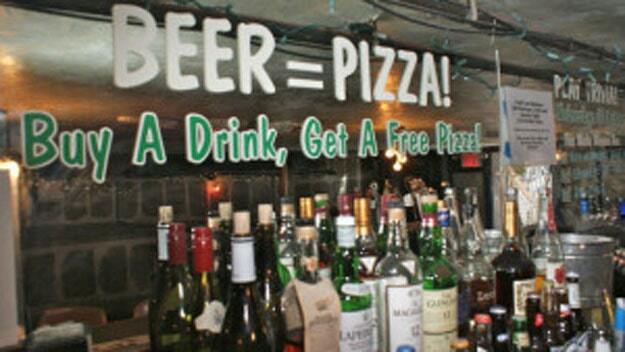 You just need to order a drink; you will get a pizza for free. There will be no restriction of time and day. You can visit anytime to enjoy your drink and pizza. In addition, you can enjoy your drink with arcade games and rotating nights of Bingo, Karaoke, and trivia. If you are not satisfied with the free drink or food and you want something more delicious, we have also options for you. NYC offers a variety of food options for people with no money. It sounds strange, but it’s true. You can get free drinks, snacks, pizza, even a free buffet. For a free buffet, you can visit Watering Hole. You can visit from 3 to 7 pm to get your free-flowing buffet that will include everything from pizza to fries, and wings. Brazen Head offers different types of free food to its regular visitors. If you have ever been there, you might have eaten some complimentary food including chicken wings and free cheese. It offers complimentary chicken wings every Monday night starting at 5 pm. You will get free cheese with your drink on Wednesday. On Sunday, you will get a free bagel with bloody mary or mimosa. A movie cannot give you full satisfaction without popcorn. This entertainment source will barely entertain you without popcorn in your hand. If you want free popcorn for your favorite show, you can visit Huckleberry bar. You will get free popcorn for Monday night movies that start around 9 pm. Free wine and food is something that does not fit into the modern culture where we are expected to pay for everything. In NYC, you are compelled to pay more than most of the cities of the world. However, you will have a few opportunities to refuel and recharge your body with free food NYC. You can explore all the above places to satisfy your craving with no money. New York City is an expensive city, especially for beginner filmmakers. I hope these three tips will help you take advantage of the cool stuff around town.